A knowledge of basic anatomy can be helpful for an improved, physical awareness. We don’t necessarily need skills in Latin to get a handle on the topic, although it could make us better at what we do. There is thorough logic within the skeletal construction of vertebrates. 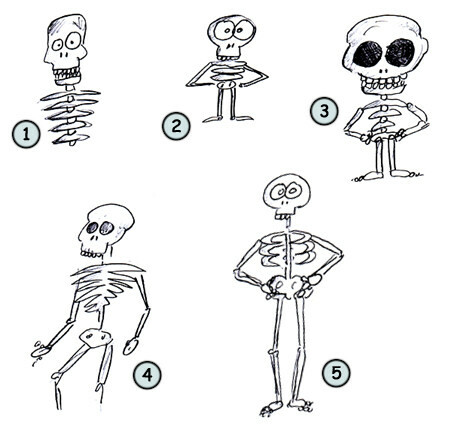 Skeleton is structure; skeleton is key! It holds us together and specializes our ability in movement. Just once, massage the heels and balls of your feet and you will understand why the associated musculature is so dense. It is all about form and substance. Musculature, while having a more pliable form and substance, necessarily, conforms to the shape of our frame…..and enables the associated kinetics. Without the skeleton we would be amorphic, sluggy blobs. The absolute, most-important quality of skeletal acknowledgement is its actual physical weight. We can feel a muscular/skeletal manipulation to such a degree that it assumes the guise of exercise right before our eyes. So lean, press, sink, push, squeeze, and squash your parts into a respective surface; it might be a wall, a floor, or the deeply-padded surface of some-such piece of Gratz Gear. The physical weight of your frame will direct the “work” and enable a pseudo (actual) weight-bearing process. The applications are numerous and limitless. Pretend there is no end. YOU COULDA BEEN A CONTENDER HOW DO YOU SLEEP?